Polaron Snowman? - Sharing It! - PlanetChristmas! By Rich in Las Vegas, January 1 In Sharing It! Yes, TPI started making their 31" version in 1994, prior to that year theirs were 30". As I recall, Sun Hill also made the 30" version from the TPI molds and then Grand Venture acquired the molds for the TPI/Sun Hill 30" version in 1998 and made it until they closed their doors in 2005. There is an interesting history of some of the molds from MAC Plastics, TPI, Sun Hill, Falcon Plastics and Grand Venture which connects them all together. How many here even know that some of the TPI blow molds were made in the US for a few years? Wow, thanks for the clarification. 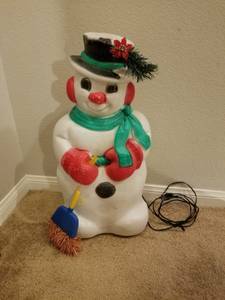 The seller has it listed as a 30" snowman but I thought that might just be an error in measurement as all of the three manufacturers I spotted list it as 31". The colors match the green 31" TPI version on blow-molded.com right down to the color of the broom. However the broom is upside down and looks to have the tip missing or broken off. The seller first listed it 17 days ago, bumps it up every few days and hasn't reduced the $50 asking price so far. I already have a couple of snowmen in various sizes but this one is still tempting.